Activated: 15 November 1942. Overseas: 14 October 1944. Campaigns: Rhineland, Central Europe. Days of combat: 167. Distinguished Unit Citations: 2. Awards: MH-1 ; DSC-9 ; DSM-1 ; SS-273; LM-8; SM-13 ; BSM-3,024 ; AM-47. Commanders: Maj. Gen. Vernon E. Prichard (November 1942-July 1944), Maj. Gen. Albert C. Smith (July 1944 to inactivation). Returned to U. S.: 7 September 1945. Inactivated: 16 September 1945. 1 November 1944: Attached to 6th Army Group. 10 November 1944: Seventh Army, 6th Army Group. 29 November 1944: XV Corps. 5 December 1944: VI Corps. 31 March 1945: XV Corps. 23 April 1945: III Corps, Third Army, 12th Army Group. Nickname: Liberator Division. 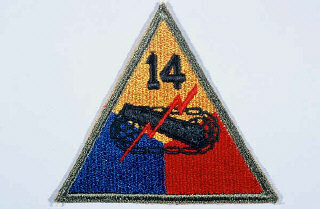 Shoulder patch: Same as the 1st Armored, but with the number "14" in the upper portion of the triangle. Association: 14th Armored Division Association, Lt. Col. J. C. Lambert, The Infantry School, Fort Benning, Ga. Publications: History of the 14th Armored Division (first edition) ; by unit members; Albert Love Enterprises, Atlanta 2, Ga.; 1944. History of the 14th Armored Division; by Capt. Joseph Carter, Unit Historian; Albert Love Enterprises, Atlanta 2, Ga.; 1946. The preceding web-site text was obtained from the Center For Military History. Maj. George P. Seneff, Jr.
Lt. Col. George P. Seneff, Jr. The 14th Armored Division was recognized as a liberating unit by the U.S. Army's Center of Military History and the United States Holocaust Memorial Museum in 1991.